Corelatus hardware can decode MTP-2 Annex A signalling. 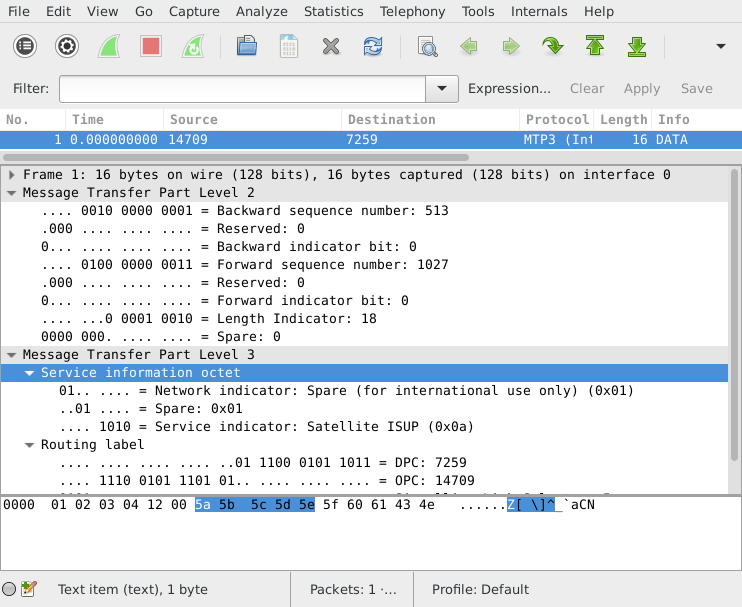 This post shows how to do it and how to look at the results with Wireshark. Classic MTP-2: A signalling link uses one timeslot of an E1 or T1. This is described in ITU-T Q.703 and it's sometimes called low speed link, because it runs at just 64 kbit/s (or, on some T1s, 56 kbit/s). MTP-2 Annex A: A single signalling link uses multiple timeslots on an E1 or T1, allowing the signalling channel to run at up to 1980 kbit/s. This is also described in ITU-T Q.703, in "Annex A". It's sometimes called high speed link (HSL) or high speed signalling link (HSSL). SS7 over ATM: Just like Annex A, this approach allows signalling to run at up to 1980 kbit/s. But it's done by completely abandoning MTP-2. Instead, it uses ATM AAL5 to carry packets. Sometimes, packets captured from Annex A seem to make no sense when viewed in Wireshark. You see thousands of 8-byte packets per second, none of which can be decoded by a higher layer. If you look at the counters on the Corelatus hardware, you'll also see that the link has no FISUs.